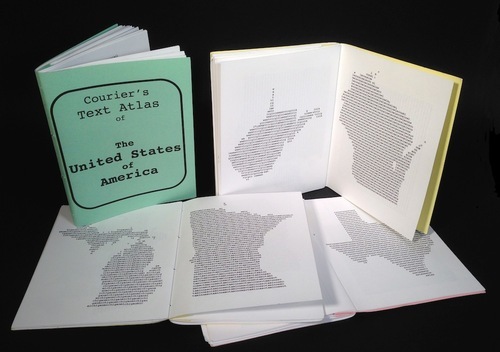 Ugly Duckling Presse (Brooklyn, NY) has released the web-only digital version of Woody Leslie’s artist’s book Courier’s Text Atlas of the United States of America. Courier’s Text Atlas is a geographically accurate 100% typed atlas of every state. This rendition combines the visuals from the book version (One Page Productions, 2013), and the audio from the album version (Gold Bolus Recordings, 2014) into one cohesive experience. Listeners/readers/viewers can select all 50 states from a drop down list, and listen to a “reading” of the state.